Mary Kay products are available for purchase exclusively through Independent Beauty Consultants. Infused with vitamin E and a blend of peptides, the result is skin that instantly looks firmer, younger and healthier. It’s the perfect age-fighting foundation for combination to oily skin, visibly reducing the appearance of pores, fine lines, wrinkles and skin imperfections. Provides all-day shine control and oil control without a heavy makeup look or feel. Gives skin a long-lasting, matte finish. Color stays true hour after hour. NOTE: In electronic media, true colors may vary. TimeWise® Matte-Wear® Liquid Foundation is the perfect combination of science and beauty. Age-fighting foundations not only help create a flawless look, they can be used as an extension of your skin care regimen. They are more than coverage – they are foundations with age-fighting benefits that work hard to give you ageless beauty. And TimeWise® Matte-Wear® Liquid Foundation is customized for your skin type. For flawless perfection, use with Mary Kay® Foundation Primer Sunscreen Broad Spectrum SPF* and Liquid Foundation Brush. Lightweight formula applies evenly and smoothly. Clinically tested for skin irritancy and allergy. Suitable for sensitive skin. 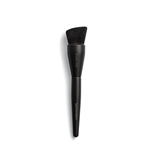 Can be applied with the Mary Kay® Liquid Foundation Brush, sponge applicator or fingertips. If using the brush, squeeze foundation onto back of hand, dip brush in foundation and apply evenly across the face using downward strokes. Dimethicone provides a silky feel, helps protect skin and improve its appearance. Vitamin E acts as an antioxidant to help neutralize environmental damage that can cause signs of premature aging. Also known to have skin-conditioning and soothing benefits. Palmitoyl Oligopeptide and Palmitoyl Tetrapeptide-7 work in synergy to help restore and maintain your skin’s youthful appearance. Silica is a highly porous, ultrafine mineral that acts like a sponge, absorbing oil so your skin can look matte without a heavy feel. Lauryl Methacrylate/Glycol Dimethacrylate Crosspolymer are specialized microspheres that maximize the formula’s ability to control oil. Special microspheres work all day to absorb oil and control shine. It also contains an ultrafine mineral that acts like a sponge, absorbing oil so skin can look matte without a heavy makeup feel. Infused with vitamin E and a blend of peptides for skin that instantly looks firmer, younger and healthier.